This article is about the new world monkey. For other uses, see Marmoset (disambiguation). Not to be confused with Marmot or Marmozets. The marmosets, (/ˈmɑːrməˌzɛts, -ˌsɛts/), also known as zaris, are twenty-two New World monkey species of the genera Callithrix, Cebuella, Callibella and Mico. All four genera are part of the biological family Callitrichidae. 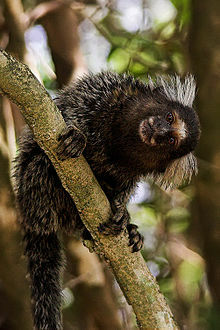 The term marmoset is also used in reference to the Goeldi's marmoset, Callimico goeldii, which is closely related. Most marmosets are about 20 centimetres (8 in) long. Relative to other monkeys, they show some apparently primitive features: they have claws rather than nails, and tactile hairs on their wrists. They lack wisdom teeth, and their brain layout seems to be relatively primitive. Their body temperature is unusually variable, changing by up to 4 °C (7 °F) in a day. Marmosets are native to South America and have been found in Bolivia, Brazil, Colombia, Ecuador, Paraguay and Peru. They have also been spotted in Central America and Mexico. They are also raised in captivity as pets. According to recent research, marmosets exhibit germline chimerism, which is not known to occur in nature in any primates other than callitrichids. 95% of marmoset fraternal twins trade blood through chorionic fusions, making them hematopoietic chimeras. Callithrix comes from Ancient Greek and means "beautiful fur". Marmoset, from the French marmouset, is of uncertain etymology, although these monkeys are currently called ouistiti in French. Marmosets are highly active, living in the upper canopy of forest trees, and feeding on insects, fruit, and leaves. They have long lower incisors, which allow them to chew holes in tree trunks and branches to harvest the gum inside; some species are specialised feeders on gum. Marmosets live in family groups of three to 15, consisting of one to two breeding females, an unrelated male, their offspring, and occasionally extended family members and unrelated individuals. Their mating systems are highly variable and can include monogamy, polygyny, and polyandry. In most species, fraternal twins are usually born, but triplets are not unknown. Like other callitrichines, marmosets are characterized by a high degree of cooperative care of the young and some food sharing and tolerated theft. Adult males, females other than the mother, and older offspring, participate in carrying infants. Father marmosets are an exceptionally attentive example of fathers within the animal kingdom, going as far as assisting their mates in giving birth, cleaning up afterbirth and even biting the umbilical cords attaching their newborn offspring to their mothers. Most groups scent mark and defend the edges of their ranges, but it is unclear if they are truly territorial, as group home ranges greatly overlap. The favorite food of marmosets is carbohydrate-rich tree sap, which they reach by gnawing holes in trunks. Their territories are centered on the trees that they regularly exploit in this way. The smaller marmosets venture into the very top of forest canopies to hunt insects that are abundant there. ^ Groves, C.P. (2005). Wilson, D.E. ; Reeder, D.M. (eds.). Mammal Species of the World: A Taxonomic and Geographic Reference (3rd ed.). Baltimore: Johns Hopkins University Press. pp. 129–133. ISBN 0-801-88221-4. OCLC 62265494. ^ Garber, Paul A.; Estrada, Alejandro; Bicca-Marques, Júlio César; Heymann, Eckhard W.; Strier, Karen B., eds. (2008). "The Diversity of the New World Primates (Platyrrhini): An Annotated Taxonomy". South American Primates: Comparative Perspectives in the Study of Behavior, Ecology, and Conservation: Developments in Primatology: Progress and Prospects. Springer. pp. 23–54. ISBN 978-0-387-78704-6. ^ "Marmoset". Merriam-Webster Dictionary. Retrieved 2016-01-21. ^ "Marmoset". Oxford Dictionaries. Oxford University Press. Retrieved 2016-01-21. ^ Stafford, S.G. (1999). "Thermoregulatory and Endocrine Adaptations of Small Body Size in Primates". Kent State University Dissertation, QP 135.S73, 1999. ^ Primate Info Net, Callithrix Factsheet, University of Wisconsin, Madison. ^ Masahito Tachibana, Michelle Sparman and Shoukhrat Mitalipov (January 2012). "Generation of Chimeric Rhesus Monkeys". Cell. 148 (1–2): 285–95. doi:10.1016/j.cell.2011.12.007. PMC 3264685. PMID 22225614.